How to Make a Castor Oil Pack! Castor oil is a common vegetable oil obtained from the castor seed, Ricinus communis. It is native to India but has been used throughout the centuries for medicinal purposes in China, Persia, Africa, Rome, Greece, and Egypt. Today, castor oil can be found almost everywhere. My masseuse consistently mixes castor oil and carrier oils, such as grape seed oil or almond oil, prior to rubbing my affected joints during my weekly massage treatments. The other day I flipped over my shampoo battle and discovered that castor oil was one of the ingredients. It is even a food additive and flavoring in many processed foods! Although castor oil was originally used as a popular laxative to treat constipation, in Ayurveda medicine, castor oil has long been used as a top treatment for arthritic diseases and joint problems. In the early 1900’s, Edgar Cayce, the man dubbed “The Father of Holistic Medicine,” recommended the use of castor oil for arthritic joints–and with good reason. Castor oil and castor oil packs are often used to help decrease inflammation and joint and muscle pain and increase circulation in the body. Castor oil is also known for its antifungal, antibacterial, and antiviral properties. 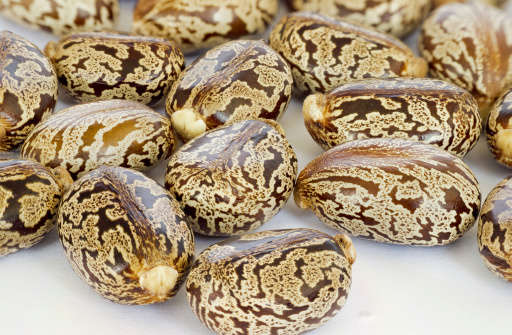 What gives castor oil its powerful healing properties? Many believe the high amounts of the unique fatty acid ricinoleic acid are responsible for the healing action of castor oil. It is also an oil that doesn’t dry from application. What about the science behind castor oil to treat joint pain? In a 2011 clinical trial published in the An International Quarterly Journal of Research in Ayurveda (AYU), castor oil was studied as part of a treatment program for 73 patients with rheumatoid arthritis. In the 15-day study, the patients were given 30 to 40 ml of castor oil with hot water. After the study ended, researchers discovered that joint pain improved by more than 50% and joint stiffness decreased by over 48%. Evidence suggests castor oil can be taken orally, especially for knee pain. Consider a randomized, double-blind, comparative trial published in the journal Phytotherapy Research in 2009. The study indicated that castor oil is a safe and effective therapy for osteoarthritis of the knee. The study observed 50 patients who were given 0.9 ml of castor oil capsules for a four-week period. Although the patients were not treated with castor oil packs, the results are still very significant. To treat muscle pain, inflammation, and joint problems, soak a cloth in castor oil and apply it to your affected joints or swollen body parts. Consider using castor oil for oral use (after consulting with your doctor). Add one tablespoon of castor oil to any beverage, such as herbal tea or freshly squeezed juice. Castor oil capsule supplements are also considered a good alternative for those that dislike the taste. For severe arthritis, combine a pinch of ginger powder to boiled water. Cool the concoction and mix in two tablespoons of castor oil. It is best to drink it in the morning or during the evening. Reduce arthritic pain or joint stiffness by massaging your problematic areas with castor oil. For optimal results, leave the oil on your skin overnight. Fold the flannel so it is thick enough to fit over your liver and upper abdomen. Soak the flannel with oil at room temperature. Place the flannel pack onto your abdomen after lying on your back, with your feet elevated. Place a sheet of plastic over the oiled flannel, then put a hot water bottle on top. Cover everything with the towel for insulation. Apply the castor oil pack for 45 to 60 minutes. When removing the oil from the skin, wash with two tablespoons of baking soda and a quart of water. You can also use water and soap. The castor oil pack can be used multiple times; however, add more oil when needed. Store the castor pack in a plastic container or zip-lock bag. For best results, use the castor pack for four days straight. Castor oil uses go well beyond joint pain relief: it is also highly regarded as a remedy for headaches, lower back pain, bladder infections, asthma, digestive problems, acne, multiple sclerosis, Parkinson’s disease, cerebral palsy, hair loss, yeast infections, menstrual disorders, ringworm, sunburns, and athlete’s foot. Soni, A., et al., “Clinical evaluation of Vardhamana Pippali Rasayana in the management of Amavata (Rheumatoid Arthritis),” AYU, April to June, 2011; 32(2): 177-180. Medhi, B., et al., “Comparative clinical trial of castor oil and diclofenac sodium in patients with osteoarthritis,” Phytotherapy Research, October 2009; 23(10): 1469-1473. Taylor, G., et al., “Castor Oil for Joint Pain,” Livestrong.com, August 16, 2013; http://www.livestrong.com/article/191759-castor-oil-for-joint-pain/. Myers, G., “How to Heal Arthritis Naturally with Castor Oil,” HomeRemediesforyou.com; http://www.home-remedies-for-you.com/articles/586/general-wellness/how-to-heal-arthritis-naturally-with-castor-oil.html, last accessed June 4, 2015. “Castor Oil Plant,” Botanical.com; https://www.botanical.com/botanical/mgmh/c/casoil32.html, last accessed June 4, 2015.